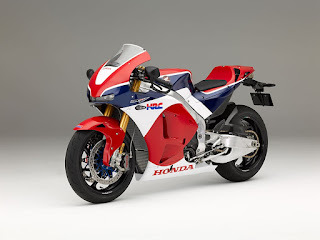 After years of speculation, denials, more speculation, and the final confrmation that Honda would indeed build a version of their RC213V MotoGP bike for the road, it's finally time to ride this most special of race replicas. We've seen the new RC213V-S so many times since it was first unveiled as a concept bike almost a year ago, that it's easy to forget the detail, so here's a recap from inside the world launch. Keep yourself in the picture as we ride both road and track versions by following our live updates here, and via the official MCN Facebook and Twitter feeds. Based on the factory RC213V motor first seen in 2012, the ultra-compact 90° V4 motor produces just 159bhp in road trim, but a much tastier 215bhp with the optional Sports Kit fitted. It has the same diminutive dimensions as the old 2007-2011 800cc RC212V motor and features sand-cast aluminium crankcases, composite nickel-plated bores, carbon fibre airbox, and titanium conrods and valves. Unlike the MotoGP bike the motor doesn’t have pneumatic valves, but runs a conventional valve spring set-up like last year’s customer RCV1000R. The standard titanium exhaust is as close to the look of the MotoGP as possible but still manages to be road legal for noise and emissions. The standard of the construction is sublime but most impressively it’s the way the silencers and the catalytic converter have been hidden away. The Sports Kit boasts a full-on GP clone system (see below). The beautiful hand-fabricated frame and swingarm is created using differing thicknesses of aluminium for strength and flex in key areas. Chasing optimal torsional rigidity can lead to a heavy frame, but this combination of material thicknesses enables Honda to achieve the necessary handling characteristics, while constraining the weight to reasonable parameters. 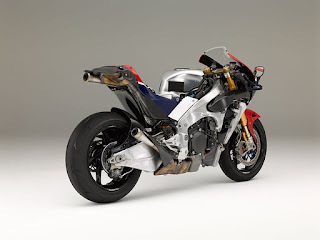 While the hand tig-welded frame is marginally different to the RC213V MotoGP bike, the swingarm makes the journey onto the roadbike completely unchanged. 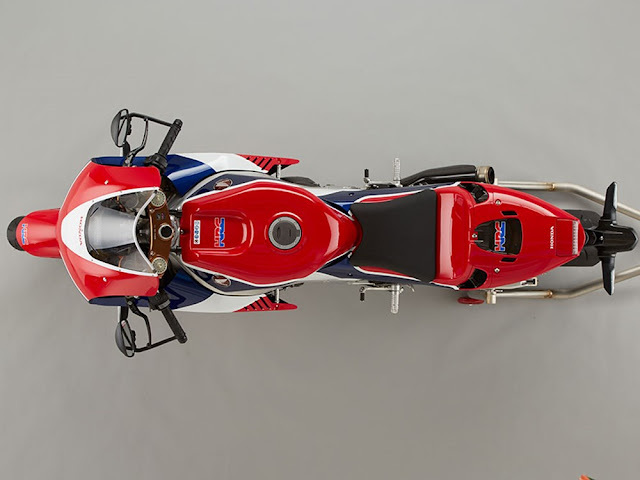 The steering head is adjustable to allow the rider to set it to their preference, or environment, while the 1465mm wheelbase is a massive 55mm longer than a Fireblade’s for improved stability. Titanium fasters are used extensively to keep the bike's mass to the bare minimum, with every nut and bolt tightened by hand to the correct torque. With all the road gear removed the RC213V-S' weight distribution is mouth-wateringly close to the racer’s. The bulk of the hand-crafted aluminium inner fuel tank's volume is positioned under the rider's seat, helping to improve mass centralisation, while simultaneously reducing the effect of fuel load on set-up. The dummy tank cover is carbon fibre. The RC213V-S' wheels are forged magnesium 17” rims shod with Bridgestone RS10 road-compound trackday tyres. The road-friendly steel discs and four-pistion Brembo four-piston calipers are similar to the factory bike’s wet-weather set-up. Mirroring the race machine’s styling, the fairing, self-supporting seat unit and tank cover are all made from carbon fibre. 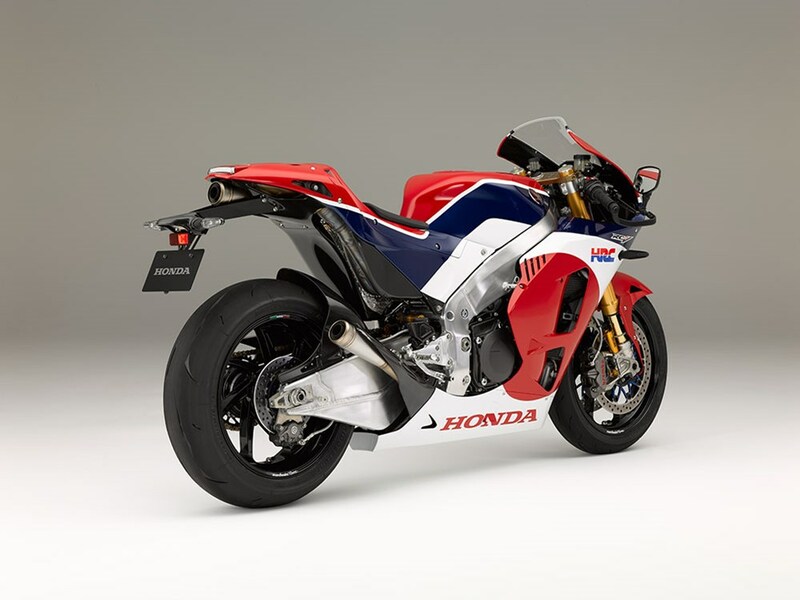 But unlike Marc and Dani’s bikes the RC213V-S has LED lights, bar-end mirrors, side-stand, starter motor, number plate holder, horn and ‘Honda Smart Key’ keyless ignition. The footpegs are six-way adjustable and for the first time on a Honda road bike the RC213V-S comes with a quickshifter for clutchless upshifts. The RC213V-S boasts a host of cutting-edge rider aids, a significant first for a Honda road bike. Controlled via the ride-by-wire throttle system and six-axis Internal Measurement Unit (IMU), there are three power levels to chose from, nine-way adjustable traction control, four-stage engine braking control, a quickshifter and five ‘mix and match’ riding modes. Launch control is available in the factory Sports Kit. Usually only found on top-level race bikes – with the exception of Ducati’s 2008 Desmosedici RR MotoGP replica – the RC213V-S benefits from Öhlins' fully-adjustable GP-spec TTX25 gas fork at the pointy end, and the latest-generation version of the firm's fully-adjustable TTX36 shock at the rear, now sporting a revised preload adjustable that's more easily accessable for quick adjustments at the roadside. Unlike the full-factory MotoGP machines of Marquez and Pedrosa, the road bike doesn’t have a seamless-shift gearbox, but uses the same conventional cassette-type gearbox as last year’s RCV1000R ‘Open-class’ customer MotoGP bike. It does have a quickshifter though, and slipper clutch to help you drift into the apex like a pro during aggressive downshifts. So what's in the Sports Kit? The RC213V-S was designed for riding on public roads, but an optional Sports Kit is also available – exclusively for track use (officer). So what are the headlines? In conjunction with a kit air duct and exhaust, the Sports ECU helps to ensure that the engine will give you everything it’s got, considerably boosting power output. It also allows both normal and inverse shift patterns via the quickshifter, as well as programming in the number of sprocket teeth, and tyre diameter. If you simultaneously push both the Start switch and the Select switch, you will activate the launch control, limiting engine rpm to the your set maximum (6,000-12,000rpm). Then you just hold the throttle on the stop, and feed in the clutch. After removal of the headlight for circuit riding, you can connect he kit ram air duct to the upper cowl to deliver ram air pressure similar to that of the RC213V MotoGP bike. Used as a set with other Sports Kit items, the exhaust is the same as the RC213V, with no catalyzer or variable exhaust valve installed. Made of titanium and about 4.8 kg lighter than the standard system. Yes, sparkplugs. The kit even includes a different set to ensure optimum ignition characteristics and heat range, in line with the fuel injection and ignition mapping, to achieve the high rpm and output possible with the Sports Kit. The shift input detection unit of the quickshifter is changed from the switch type for public road riding specifications to the load-sensor (strain gauge) type, which is the same type as the one on the RC213V. This makes it possible to detect the direction of the force applied to the shift rod when operating the gear shifter, so accommodating both the normal and inverse shift patterns becomes possible. Because detection of the magnitude of the force is also possible, the shift operation load becomes adjustable to 5 levels (with 2 higher and lower levels from the standard position). Vehicle speed, engine rpm, grip opening, and other data is recorded in real time and combined with GPS coordinate data. The data is recorded in the supplied USB memory, and analysis is started after connecting the USB memory to a Windows computer with the dedicated analysis software program installed. Just like the RC213V, the owner can change the length of the connecting rod with the adjustment bolts, which give about 30mm of ride height variance. Brembo track pads are in the pack, along with a remote brake adjuster. In response to the substantial increase in engine speed when riding on a circuit, there are a variety of sprocket options. 15, 16, and 17t drive sprockets have been coupled with 40,41,42,43,44and 45t driven sprockets, making it possible to set the ratio according to the speed range at each circuit and the rider’s preference. Myriad other little parts from fairing drain plugs to electrical loom blanking caps, an open clutch over, different bum-stops, paddock stands and a cover are all thrown in, too.